Use cinnamon30 at check out for 30% off! This February, we’re highlighting our hottest flavor, Cinnamon! All month long you can grab your flavorful batch of cinnamon-flavored saltwater taffy for 30% off. With the perfect amount of cinnamon, this sweet and savory flavor is loaded with flavor! It’s a sure-fire hit for your taste buds. Even the famous girl band, Spice Girls, couldn’t hold a candle to this customer favorite. You can include this in your Valentine’s special gift or pass it along as part of your kid’s valentines. Rather not share? Believe us. We get it—pair your cinnamon taffy batch with a delicious chunk of chocolate, and you’ll hit the right notes all month long. Along with everything included in this delicious treat, what isn’t included makes this saltwater taffy even yummier. Our Cinnamon Taffy is free of tree nuts, peanuts, and gluten—making it one of the best ways to enjoy your favorite flavor without any of your food allergies acting up. For over 100 years, Taffy Town has been manufacturing gourmet Salt Water Taffy. Each taffy piece is deliciously whipped to perfection for our signature melt-in-your-mouth texture with a wide variety of true to life, unique and amazing flavors. Don’t worry about our process either. 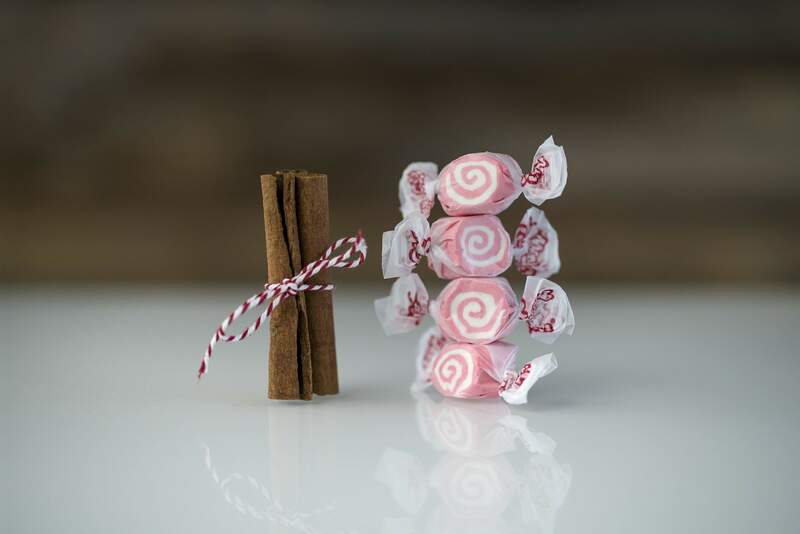 Our cinnamon taffy is Made in the USA in a batch process, using the best ingredients and flavors we can find. Our factory is free of tree nuts, peanuts, and gluten. All our products contain egg whites and milk in for a creamy, melt-in-your-mouth taste and texture that is without comparison. Each taffy features a creamy swirl of white inside a beautiful red coloring. That way it makes it easy for you to distinguish which taffy is going to hit those high spice levels perfectly. Then it’s wrapped in the trademark red Taffy Town lettering to help our ever-growing fan base identify our product wherever it may be sold. Stop wasting time thinking about how good Cinnamon Taffy sounds, grab a bag of your own! Order yours today and get this sweet and spicy treat fresh from the factory!